We can provide your organisation with support for every element of sustainability, from strategy, to delivery, to reporting. ONLINE SIGN UP AND REPORTING TOOLS: We have affordable online tools for you to use to inspire, track and report on volunteering/sustainable behaviours/CSR activities. They are 'white label' enabling you to brand for your organisation. No more messy spreadsheets, a user friendly system for employees and easy reporting across multiple locations. CREATIVE REPORTING AND COMMUNICATIONS: We help you to share your performance, and tell your sustainability story in a way that will engage and excite your stakeholders. We have delivered projects across the private and third sector, always looking to connect stakeholders to sustainability, getting them engaged and taking action. Some of our favourite projects below. To chat to us about your needs use our Get in Touch page or connect with Director Donna Mckitterick via Linked in. To deliver an engaging Annual Sustainability Report for 2017 performance at Hammerson. In 2017 Hammerson launched a new commitment to be Net Positive for carbon, water, resource use and socio-economic impacts by 2030. As such, the 2017 report had to take into account the new level of reporting that Net Positive will bring. Our task was to ensure the report made the new reporting structure clear, whilst still retaining easy to access and engaging content around mandatory GHG reporting. We worked closely with Hammerson and K4 Creative to produce a colourful, engaging report that brings to life the data and performance commentary from Hammerson. We have managed this year to make the report shorter and move vivid with a greater focus on graphics and case studies than previous years. Take a look at the 2017 Hammerson Sustainability Report here . To support the launch of the latest research carried out by Hammerson and JLL looking at the True Value of Retail by creating event space designs and collateral that would bring the research to life and engage stakeholders. We worked with K4Creative to design and deliver a full report from the research. The Report shares key findings from the research and will form the 2015 baseline for Net Positive reporting by Hammerson. 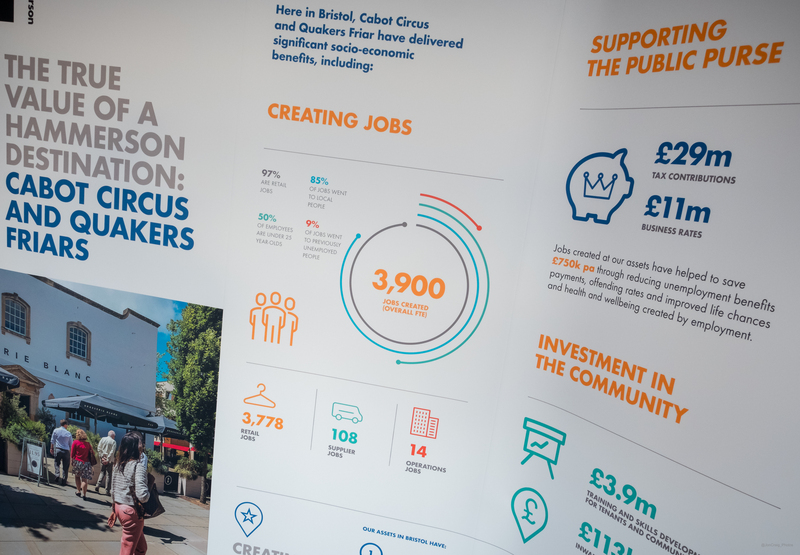 The report makes clear the positive impact the retail sector can have on a local community, and we bring it to life with stories relating to key stats such as the creation of 40,000 jobs across the Hammerson group. We worked with K4 and CMSLive to create a set of event displays for use at launch events run across Bristol, Leeds, London and Edinburgh. The series of displays brought to life the research and included footprint headlines, case studies and information on Hammerson's strategic direction. For Bristol, Leeds, Scotland, London, Southampton and Ireland we also created asset specific or regional footprint and case study books that share some of the headlines from those footprints and take a look at some of the projects helping to deliver positive impacts. We provided access to our innovative engagement platform for the third year, bringing in new actions, and new challenges for teams across Hammerson. Employees can find volunteering opportunities or actions to take that will have a positive impact and ‘bank them’ with the reward of virtual butterflies. Every month we recognise the most active participants. Every one of Hammerson's 11 UK shopping centres is now active on the platform, plus their UK offices, and their Ireland teams also joined in 2017. Hundreds of contractors from ABM have also joined in, as we have created a 'team' function enabling them to take part alongside their Hammerson colleagues at the assets. In 2017 we created some 'Next level' actions, to challenge those who were already very active on the site. The Life-Less plastic challenge created by the Butterfly Bank team was one of them - a 30 day challenge to give up eight of the most common types of plastic entirely, this included disposable cups, cutlery and some food packagings. The shopping centre team at Bullring took on the challenge, and showcased their efforts in a joint promotion with Selfridges held in the centre, encouraging shoppers to ditch single use bottles. Below is just a snapshot of the impact Hammerson employees have had in just one year. With The Butterfly Bank designed to support the adoption of new habits, we hope the impact extends for years to come. The benefits of such high level employee engagement are two fold in relation to our ambition to become Net Positive for carbon, water, resource use and socio-economic impacts by 2030. Inspiring employees: Our centres each have their own way of encouraging uptake, including team meetings and challenges. The teams chat about what actions they have taken at home, and what actions they can take at work. With such a challenging sustainability vision to deliver on, it’s key our employees are inspired personally to challenge themselves and seek out new solutions for the business. The Butterfly Bank is a great way to get people thinking about how their personal values are put into play at work. Engage internal and external stakeholders in the new ambitious Net Positive commitment by Hammerson Plc. We worked with Biscuit Productions to create a series of mini films showcasing the new commitment by Hammerson. We developed storyboards to tell the key messages, and carried out interviews with key internal and external stakeholders looking at the new targets and work to date in the four net positive areas: carbon, water, resource use and socio-economic impact. A series of six short films were produced and the films have been shared across various channels, including the iPdf version of the Hammerson 2016 Sustainability Report. The films have also been used at events to engage stakeholders quickly and effectively in what the commitment to become net positive will mean, and the types of project and level of change that will be required. They were also used to engage the internal audience, helping to grow understanding of what Net Positive means for the business. CEO David Atkins introduces the commitment and explains why it's imperative companies like Hammerson do more. Hear from key internal and external stakeholders what the commitment means for them, their organisations and for the sector. We take a look at the Hammerson commitment to become Net Positive for Carbon emissions by 2030. We explore what that means for them as a company and some of the projects that are already underway. We take a look at the Hammerson commitment to become Net Positive for Resource Use by 2030. We explore what that means for them as a company and some of the projects that are already underway. We take a look at socio-economic projects across the group and speak to key community stakeholders about the commitment. All the films can also be found here: http://sustainability.hammerson.com/357/our-net-p... and on the Hammerson Plc Youtube channel. To review activity and plans across Aspinal of London relating to sustainability, formalising ambitions into a clear environmental policy that could be communicated to internal and external stakeholders. We reviewed current activity within Aspinal of London and looked at potential areas for development. We developed a clear environmental policy that would communicate key areas of focus to external and internal stakeholders. We also developed an action plan that would expedite activities internally and ensure delivering against the policy. 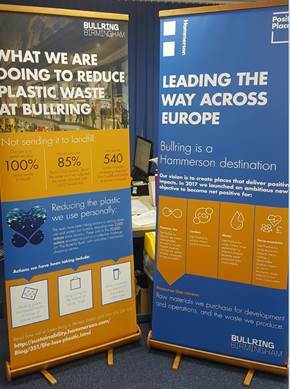 We worked with the team at Bullring to promote their activity to reduce plastic use, and to protect our oceans as part of a wider World Oceans Day activity with Selfridges in 2017. Sustainability. Consumer Communications. Brand Messaging. 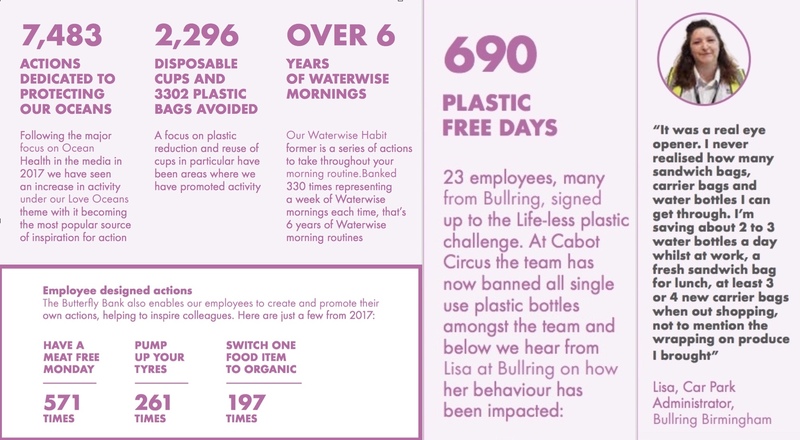 The team at Bullring have been part of a campaign on our behaviour change platform - The Butterfly Bank, and had recorded a huge number of actions to protect our oceans. 23 of the team had taken part in the 'Life Less Plastic' challenge set by The Butterfly Bank team, giving up 8 types of plastic for 30 days. When Selfridges wanted to run a campaign to promote World Oceans Day and the avoidance of single use plastic, we worked with Bullring to ensure the Bullring team also promoted their own messages around plastic and ocean protection, sharing their own activity and using their learning from The Butterfly Bank to engage shoppers in their own more sustainable behaviours. Our Butterfly Bank platform is designed to make employee engagement on sustainability and community investment deeper and more rewarding for your employees and customers, whilst offering you a cost effective, simple way to bring together sustainability activities to track and report on them. Employee Engagement. Web Platform. Sustainable Behaviours. Community Investment. Recognition and Reward. HR. The Butterfly Bank is our engagement platform, designed to help you inspire, reward and report sustainable and community behaviours. You can see more on the platform at thebutterflybank.co.uk. We were shortlisted for the EE Award for Best Employee Engagement Project in 2015, featuring our partnership with Hammerson Plc. Let us show you how it works - for access to our demo site email tbb@coriandercows.co.uk or call Donna on 07738 873412. Our system is a clever little thing, not only does it look good, it's easy for people to use, and is designed to be easily be-spoked to suit your needs. It has been built to automatically update much of the content and can be managed either exclusively by you, or with a little help from us remotely, making it very cost effective. Our membership system means you can continue to use the platform year after year at a significantly reduced price after the first year where we apply a small set up fee. Become a company member of The Butterfly Bank: We'll provide you with your own branch of The Butterfly Bank, with your own branding and URL, and you can invite employees and/or customers to open an account. Set your Butterfly Bank Challenge: For every action people take, they’ll bank virtual butterflies. You can help to inspire action by setting your own challenge for your audience - a target number of butterflies to bank and a clear reward. We’ll advice you on how to shape rewards, both personal for the members and a community based reward that helps tell your story. It might be a new sensory garden for local children or the creation of a real butterfly bank to support local wildlife. Shape ways to bank butterflies: Identify actions you wish to promote, from volunteering to recycling, or the adoption of new internal processes. Then turn them into bankable actions and give them a 'butterfly value'. We have a whole library of actions you can access, and can help to create company specific actions just for you. Use the reporting suite to create personalised reports: You can report on volunteer hours, positive actions taken, behaviours adopted and more. Our league tables and automatically updated online 'recognition wall' make it easy for you to recognise and reward those leading the way. It builds on personal passions and values: The line between home and work has become increasingly blurred over the past few years, with personal values playing a greater role in employer choice and a focus on the health and wellbeing of employees. We help an organisation to harness this new relationship with their workforce. With The Butterfly Bank, we set new behaviours and activities in the context of the things people personally care about. We create links and touch points that go beyond the borders of the organisation, with people’s personal passions and values driving activity. It brings together community investment with engagement activity: We bring together community investment/donations with engagement activities. This is rare in companies, as the two are often delivered separately. We harness the corporate donations to drive new behaviours amongst employees by directly linking activity with funding in a simple and visible way. It facilitates the capture and reporting of behaviours and volunteering: We are designed to make reporting as simple as possible and that means you can feedback what areas are most popular and which teams are most engaged and reward these activities. Plus, you can see which communication campaigns work best and shape future communications accordingly. For more on The Butterfly Bank get in touch for a demo. Plus you can download our Introduction to The Butterfly Bank or visit www.thebutterflybank.co.uk. An evolution and re-launch of the sustainability framework for FTSE 100 Real Estate Company Hammerson with stakeholder and employee engagement to raise awareness. Sustainability. Communications Strategy. Brand Messaging. Campaign Creation. Employee and stakeholder Communications. To create a new communications framework for sustainability within Hammerson and to deliver key initiatives to raise awareness both internally and externally. A new sustainability vision was developed – to create places that deliver positive social, environmental and economic benefits. Five core Positive Places commitments were outlined. The commitments offer a quick insight into Hammerson’s deeper strategy and provide a clear communications framework for all activities across the group portfolio. A programme of employee and stakeholder engagement initiatives is underway to raise awareness of the commitments and facilitate their adoption at the shopping centre and retail park level. Developing a dedicated sustainability website for investors and other stakeholders to keep up to date with reporting, stories and plans from Positive Places. Sustainability. Stakeholder Communications. Website Development. Coriander Cows were asked to develop channels of communication to raise awareness of Hammerson sustainability activities with key audiences, these included investors. In order to facilitate access to, and understanding of performance and ambitions, we developed a new dedicated website to communicate all data, stories and project updates. The website is navigated by the Positive Places commitments, reinforcing the use of these as anchor points for all sustainability work. The creation of a bespoke custom report builder will enable audiences to explore performance data, offering transparency. The Big Positive Weekend was the UK's first nationwide sustainability road show designed to engage the consumer. In a series of weekend events created through a collaboration of multiple consumer brands, the campaign brought sustainability engagement to the masses and was a finalist for the 2015 BiTC Award in Communicating Sustainability. Sustainability. Campaign Creation. Consumer Communications. Retailer Engagement. Community Engagement. Design an engagement activity that utilises the powerful engagement platform presented by Hammerson’s shopping centre portfolio. The campaign provides a platform for collaborative retailer communications on sustainability. The first outing in 2014 brought together six consumer brands – Renault, Nationwide Building Society, E.ON, H&M, SEALIFE – in a nine week series of events from Southampton to Aberdeen.actions. 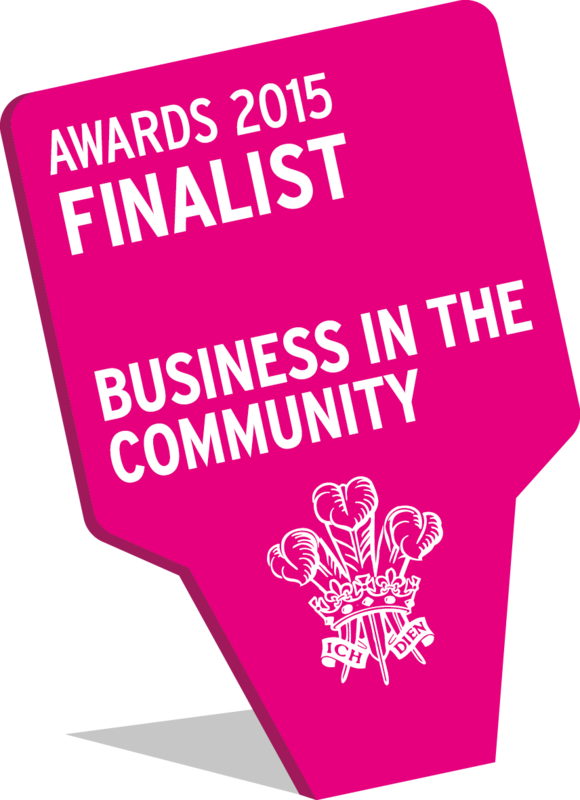 We were a finalist in the BiTC Awards 2015 for Communicating Sustainability. The Big Positive Weekend is returning for 2016. A new look, a new theme – the conscious consumer. For more information on the opportunity get in touch hello@coriandercows.co.uk. "The consumer’s realisation of how much positive change you can drive with purchasing decisions is a defining moment in the shift to a more sustainable lifestyle. The Big Positive Weekend is designed to create many such ‘moments of truth’, whilst introducing products and services that fit the bill, in the very environment where action can immediately be taken." The Butterfly Bank is an engagement platform created by Coriander Cows. It aims to inspire, reward and report on volunteering, community engagement and sustainable behaviours. We joined up with Hammerson in May 2014 to bring butterfly banking to employees across the Hammerson portfolio, including two offices and nine shopping centres. The Butterfly Bank. Employee Volunteering. Charity Partnerships. Sustainable Behaviours. Employee Engagement. Hammerson's volunteering policy gives every employee three paid days of volunteering per year. In previous years volunteering uptake has been fairly restricted, with most activity happening on the annual community day when up to 300 employees head out for one day. Hammerson are keen to drive uptake of the full volunteering allowance. Hammerson joined up with Coriander Cows to utilise The Butterfly Bank engagement platform and concept. The Butterfly Bank was co-created by Coriander Cows to offer clients and partners an innovative new employee engagement tool. It's simple, we turn volunteering opportunities, new behaviours and sustainability initiatives into 'bankable' actions. Employees can record their activity and bank virtual butterflies. A clear reward structure is used, and when a target number of butterflies are banked a community investment or community project is delivered. For more on The Butterfly Bank get in touch for a demo. Plus you can download our Introduction to The Butterfly Bank or visit www.thebutterflybank.co.uk. 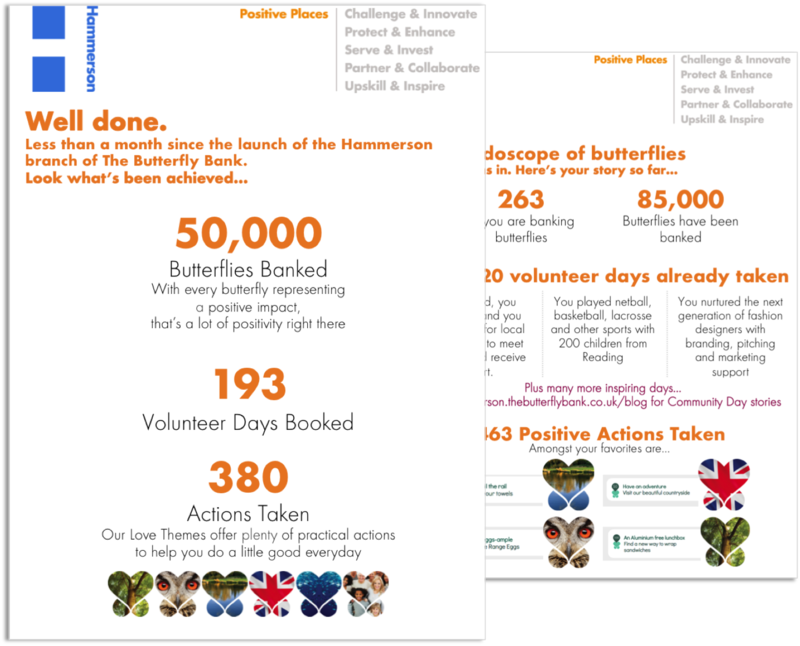 In May 2015, employees were set the challenge to bank 100,000 butterflies by the end of 2015, through volunteering and positive daily actions such as walking to work and buying organic. This annual event sees nearly 300 employees volunteer on the same day. The Butterfly Bank platform enables employees to create an account, and from then on they can sign up to volunteer activities throughout the year with ease. This means the burst of engagement for community day builds a foundation for the year ahead. Their details are moved onto sign up lists, easily provided to volunteer partners. They can withdraw and see spaces counting down. “The Butterfly Bank made community day promotion and sign up much faster and easier to manage. Plus, it has meant we can continue to promote volunteering across the rest of the year and reward behaviours we need to become a more sustainable company”. Some stats: Community Day and The Butterfly Bank was launched at 5pm – 71 signed up and had booked their activity by 6.30pm. By lunchtime the next day, 120 had signed up. Within 3 days 222 days were booked. Hammerson has teams across the UK based in shopping centres and retail parks. They were keen to both showcase what different centres were doing, to support involvement in community day at centre level and to encourage staff from across the group to join a different team in a different location for their volunteering. The platform brought together all community day opportunities in one place. It enabled London based staff to head out and join centre teams for their volunteering activity. Previous community day was arranged by the local centre teams and not communicated with the rest of the group until after the activity had taken place. By utilising The Butterfly bank, employees can now visit the platform throughout the year to find new opportunities with our charity and local partners. We have created five bespoke butterfly banking themes for Hammerson that reflect key strategic areas for them. Employees are rewarded with virtual butterflies for each activity banked and regular recognition activities help to reward those leading the way. Awards designed and delivered in October 2015 celebrated activity across the company and the fact that Hammerson employees met their challenge 3 months early. A new challenge has been launched. See our Hammerson Butterfly Banking Case Study . Designing an annual day of employee engagement activities designed to raise awareness of sustainability and celebrate health and wellbeing. Health and Wellbeing. Sustainability. Employee Engagement. Campaign Creation. HR. Every year Hammerson provides employees with an environmental awareness day. For 2014, they wanted to embrace a wider remit for the awareness event, encouraging health and wellbeing amongst employees. 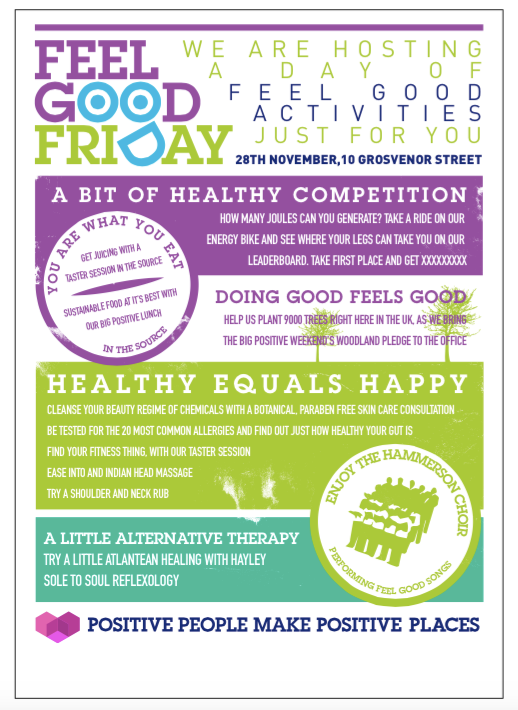 We helped to develop Feel Good Friday, a day of activities held at their head office. The desire for the day was to create a feel good factor for employees. In order to do this we helped to develop the agenda and the campaign to drive engagement and uptake of the activities. Doing good feels good - easy ways to protect our natural environment, including a mini version of the Nationwide you pledge, we plant campaign designed for The Big Positive Weekend. A little alternative therapy - a little chance to taste some alternative therapies available. Over 50% of employees gave the event 9 or 10/10. The remainder gave it 8/10. The event was so well received that it is returning for 2015, extending to Hammerson's Reading office giving employees the double the opportunity to feel good. Plus, we are extending activities to include nutrition and personal training plans, giving employees clear guidance for health and wellbeing going forwards. "The day was fantastically prepared and really well organised. I would love to see it happen again next year." Helping Hammerson Plc to communicate the sustainability credentials of their new SKA Rated Gold offices. Employee Communications. Visual Communication Campaign. Recycling. Sustainable Office Behaviours. 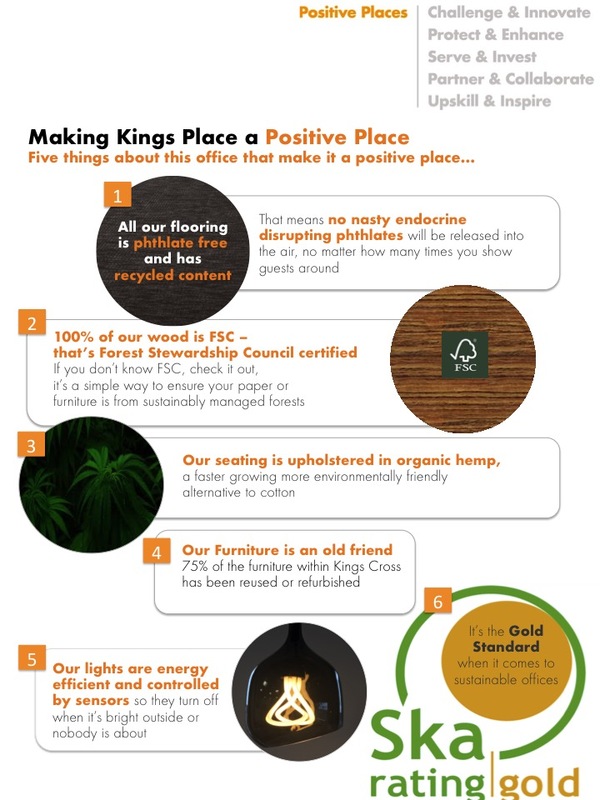 To raise awareness of the Gold Ska Rating for the new Hammerson offices and encourage sustainable behaviours. We developed a set of employee communications to showcase things about the office, six things about the kitchen and six things about the desks. These communications helped to raise awareness of the materials used and their supply chain; the external accreditation achieved and the smaller details put in place such as fair trade tea and coffee for a positive cuppa. To enliven the annual sustainability report, making it more accessible and engaging for stakeholders. For 2016, there was an additional aim to communicate the launch of Net Positive. We project managed the creation of the report, bringing together content, and working closely with designers - K4 Creative - to create, deliver and share the annual sustainability report. We created ideas for bringing the Net Positive commitment into the report, and outlined more interactive elements for the report including videos and further data links available directly from the ipdf. We also brought in graphs and charts to make the data more accessible. 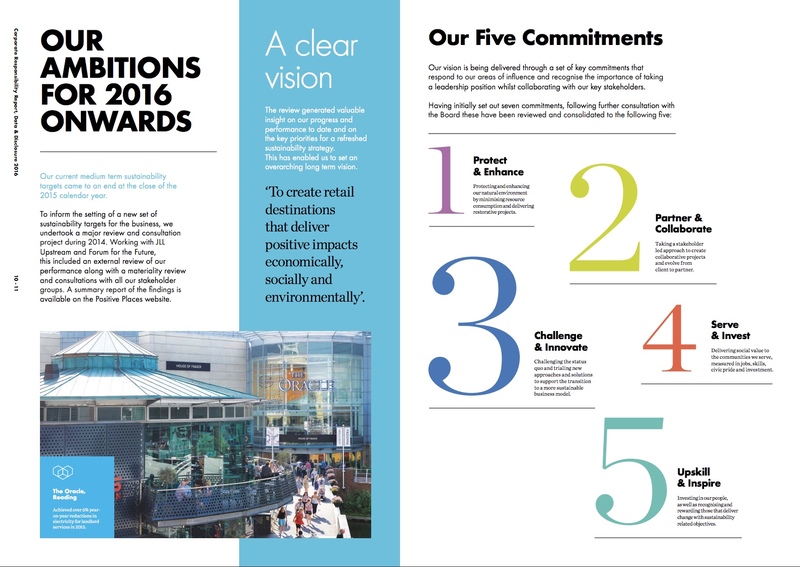 Take a look at the ipdf interactive version of the Hammerson 2016 Sustainability Report. Coriander Cows worked with Ethicore to design a multi stakeholder summit event that brought together 150 key players in the fields of conservation, health and child welfare. Stakeholder Engagement. Event and Workshop Design. Conservation. The National Trust, Play England, NHS Sustainable Development Unit and RSPB engaged Ethicore to design and facilitate the launch of a new initiative to reconnect children with nature. National Trust wanted to explore the potential for collaboration with other organisations in response to the natural childhood report produced in 2012. As an associate of Ethicore, Donna from Coriander Cows got involved in creating and leading the Natural Childhood Summit for The National Trust. The day brought together community leaders, charities, local government, corporate partners and academic experts to build consensus around action needed to give every child the opportunity to form a personal connection with the natural world. Coriander Cows helped to develop and lead a day of workshops designed to identify shared goals which could form the basis of any coalition to reconnect children with nature. As a team we.. Facilitated a process and packaged the results to inspire action. As well as lectures from leading players, a series of activities were run in smaller groups to elicit key goals, ambitions and targets for each stakeholder. Disruptive innovation design techniques were used to get stakeholders to consider their plans for the year ahead and how these could be adapted to increase the potential for reconnecting children with nature. The summit led to the development of a multi organisation task force with a manifesto co created by all stakeholders at the event. "Ethicore brought new insight and an innovative approach to stakeholder engagement - I recommend them highly!" The Natural Childhood Report highlighted a growing problem with nature deficit disorder and a detachment from our natural environment. You can find the report here: The Natural Childhood Report, The National Trust and Stephen Moss. Consumer engagement activity promoting Nationwide’s sustainability commitments including the creation of woodland right here in the uk. Delivered as part of The Big Positive Weekend 2014, over 400 pledges were made by the public, with over 7 hectares of woodland planted in Hyde Dorset. Sustainability. Conservation. Brand Messaging. Campaign Creation. Consumer Communications. Project Management. As the headline partner for Hammerson's Big Positive Weekend in 2014, Nationwide Building Society needed an interactive campaign that would promote their sustainability commitments. We worked with Nationwide and their internal creative team to identify key messages for the consumer. We identified Nationwide's plans to create new woodland areas in the UK as the core message to promote as we believed this would provide an emotional hook and a great opportunity to create a sensory experience for our shoppers with the creation of a woodland set. Shoppers were invited to take part in 'you pledge, we plant'. They were introduced to four simple behaviours they could adopt that would help to protect our woodland. Guidance and information was provided to help them adopt these behaviours. 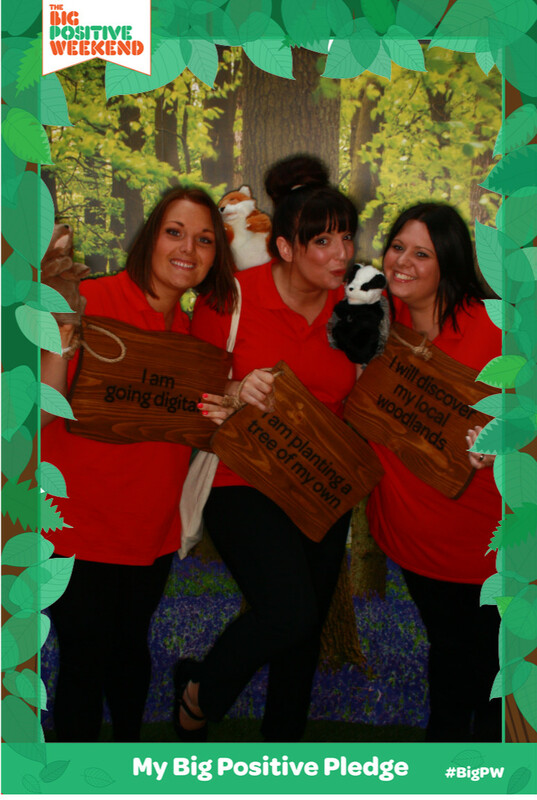 They were invited into our woodland scene to make a personal 'photographic pledge' using our photo booth. They could share their pledge instantly with friends and family. For every pledge made, Nationwide planted a tree - over 4000 trees were planted as a result of Big Positive Weekend pledges creating 7 hectares of woodland. "Nationwide is pleased to have been a headline partner for The Big Positive Weekend. It welcomed the opportunity to take our sustainability messages into the heart of the UK via the roadshows as we reached many different parts of the country. The campaign really captured the imagination of passers-by and helped us to promote our agenda. Nationwide volunteers enjoyed visiting the variety of local shopping centres to help people make their pledges to protect UK woodlands. We engaged with a huge 4,000 shoppers as they made pledges and because of this, over 4,000 trees have been planted in Dorset." We worked with Hammerson to develop their approach for annual reporting of corporate responsibility performance. Application of a new Positive Places brand and the launch of a new set of commitments we helped to create, enabled us to showcase the group's approach to CR in the context of a new ambitious vision. We also brought in a more visual approach to reporting and helped to create a summary report to enable a wider stakeholder group to access the reporting data in a lighter way. REPORTING. SUSTAINABILITY COMMUNICATIONS. STAKEHOLDER ENGAGEMENT. BRAND CREATION. 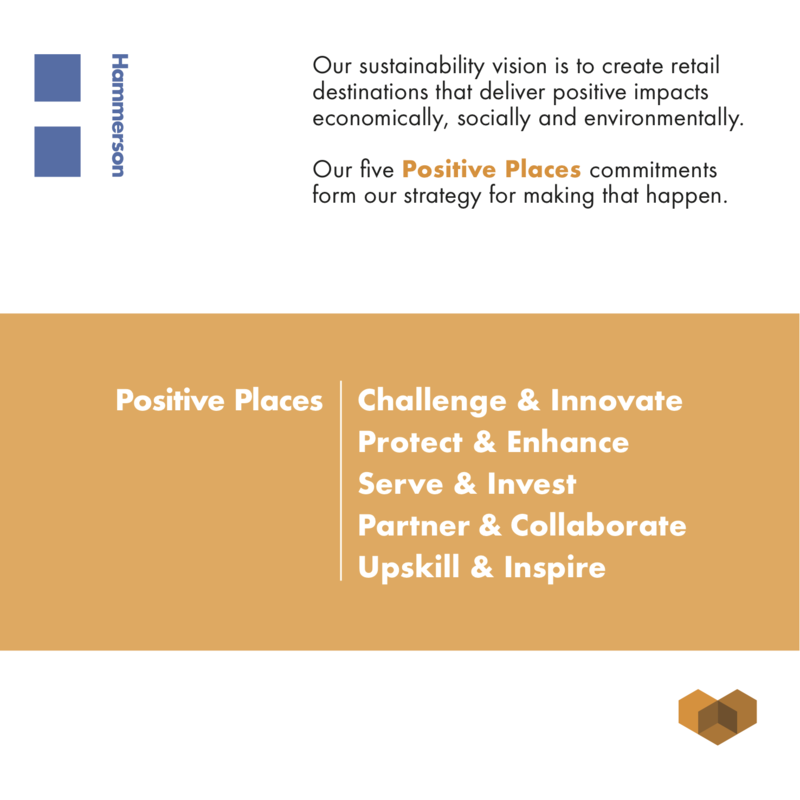 To create an annual sustainability report that not only shared data and performance, but also launched a new brand and set of commitments for Hammerson's approach - Positive Places. As well as creating a light touch way for stakeholders to engage with the report. We project managed the creation of the 2015 report. We worked closely with K4 Creative to design a more colourful and interesting report than previous years. We brought in many more visual elements and a higher level of stories and case studies to set data in context. We also brought in material showcasing the new Positive Places commitments in a way that stakeholders could easily understand. The report has helped to cement the Positive Places commitments as a clear communication framework, which will enable Hammerson to continue to update on progress throughout the year. Download the Hammerson 2015 Corporate Responsibility Report .